Hi! 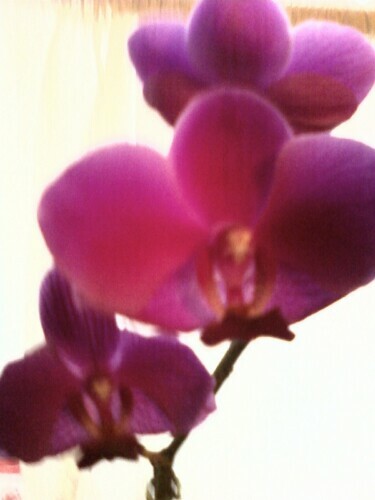 My dad got me a purple orchid for Mother's Day; I remember the tag said "phal"-a-something, but that's about it. It was doing very well, and when it lost it's flowers, I followed the directions on cutting it back. Well, so far, I've had 2 new leaves come out, but no hint of flowers; but then, I don't even know where I'm supposed to be looking for them. Any advice/help would be greatly appreciated! I'm gonna try and put pics on here, but I'm not tech-savvy at all. Oh ..... hooray, it worked!!! 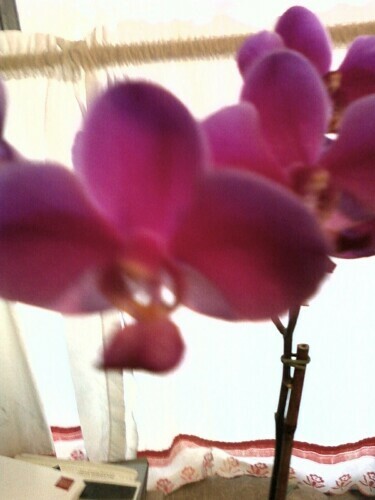 It's a phalaenopsis orchid. They are among the easiest of orchids to grow. They like bright indirect light, such as an east window. They generally flower in late winter or early spring, but they won't bloom without lower night temperatures, even as low as 55Ã‚Âº F. They prefer warmish day temperatures, around 75Ã‚Âº to 85Ã‚Âº, but with that much warmth, they need higher humidity, so you may have to supplement by misting or by setting the plant on a humidity tray. They will happily adapt to normal house temperatures between 65Ã‚Âº to 70Ã‚Âº, but they do need lower night temperatures in order to bloom nicely. They should be planted in a good orchid-growing medium, because they need very rapid drainage. The medium should be kept slightly moist, but the growing tip of the plant shouldn't be allowed to stay wet. Too much moisture leads to rot and fungal growth. A couple of things - if it was blooming at Mother's Day you now have a period where it won't bloom for maybe another year. The stalk will peak out from around the leaves. A root shoot may come out too and it can be a little confusing at first figuring out if it a flower stalk or root poking out. I don't ever prune the old stalks right down to the plant until they obviously turn brown and are dead. I just trim off the spent flower shoot to a nub on the stalk and they frequently send out a new shoot of flowers. Since you are getting new leaves it is doing well. They are very heavy feeders and would appreciate a small pinch of orchid food with every other watering. When it's ready to bloom again, you'll see a blunt nub that looks a lot like the root start to form near the base of the plant, but instead of growing down, it'll start to grow upward -- that's your flower stalk. Depending on your light situation, the stalk may or may not need to be supported -- did your blooming plant have something supporting the flower stalk? I try to give the pot 1/4 turn every day or so, and also turn the flower stalk AWAY from the window to encourage it to grow vertically. This makes it easier support upright later on. If the light it gets is on the weak side, the flower stalk will be somewhat floppy and will not be able to hold up when the flowers bloom to weigh it down. * Note * I don't actually put a support on the flower stalk if I'm tying it to a bamboo stake or a chopstick until the flower buds start to form. I don't know if this is correct, but I'm always afraid of accidentally damaging the flower stalk or where the buds will grow out. I *have* used the wire with a loop on the end that came with my orchids which only touches the stalk at the wire loop to train a growing stalk to grow in a desired direction, especially if it's a wayward stalk that's trying to grow sideways. I live in a climate way different from yours so it's no indication, but my 2 flowering age Phalaenopsis are starting to send up flower stalks now. I occasionally water my orchids with what I call "used coffee ground dregs water" -- I use a personal French press to make coffee so I add filtered water to the carafe with the UCG and water with the *very* weak coffee, and let the UCG pour into the orchid pot. Thank you for your replies and advice; I learned a lot. Kisal, you (and others) say that the orchids may need to be misted. I thought I read somewhere that orchids can get rot and potentially die if they get water in the leaf "stem." And what's HTH? I'm not a proponent of misting any plant, but it is one of the accepted ways of increasing humidity. I felt I should include it as an option. I believe humidity trays work much better, and they are what I use when I have plants that want high humidity. I do live in Oregon, though, where there is seldom a problem with too little moisture in the air. If I were going to mist your species of orchid, I would do so early in the morning. Or, it might be possible to protect the growing tip in some way ... perhaps by laying a small piece of lightweight plastic film over it ... while you spray the rest of the plant. "HTH" stands for "Hope This Helps".